A Fairey mural mocking consumerism and power was posted on a vacant, graffiti-riddled building on Gratiot. Photo by Steve Neavling. A Wayne County judge has dismissed charges against world-renowned street artist Shepard Fairey, who was facing up to 10 years in prison. 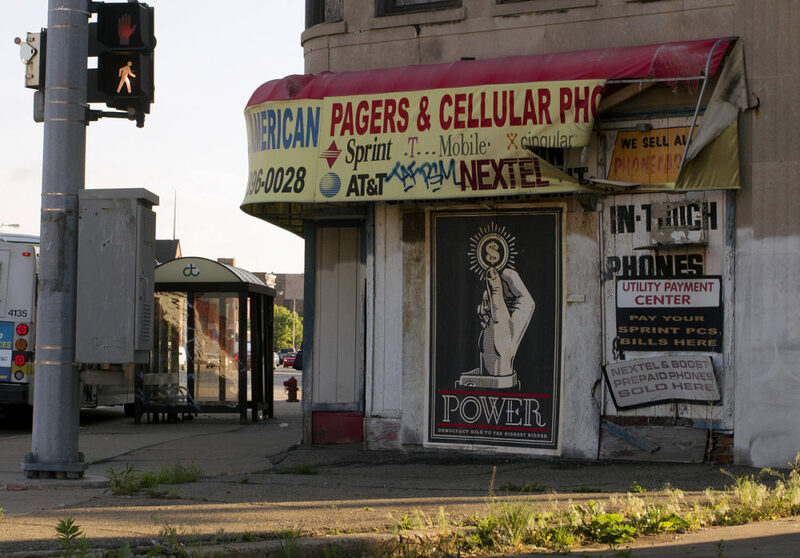 Fairey was charged in June 2015 with numerous felony charges of malicious destruction of property for allegedly posting his iconic work around Detroit while he was in the city to paint murals for billionaire Dan Gilbert. But the case was weak: No one witnessed Fairey posting the images. Wayne County Circuit Judge Cynthia Hathaway dismissed the charges on June 21 at the request of Fairey’ attorney, her office confirmed Wednesday. The decision comes about 10 months after District Court Judge Kenneth King said there was enough evidence to warrant a trial, adding he was dumbfounded by the “arrogance or pure stupidity” of the street artist. Fairey’s arrest was controversial because the understaffed Police Department had “a team” of investigators handling the case at a time when violent crime is relentless. Fairey has been arrested at least 17 times for posting his work on private and public buildings without permission. We couldn’t reach Fairey or prosecutors for comment. when violent crime is relentless. If you cannot take care of little things, you certainly cannot take care of big things. This is how rudy turned NYC around. No begging, no graffiti, no jaywalking, no car window washer beggers, loitering, etc etc etc. Fairey did it, deal with it. Its hard to stop violent crime, you can investigate it, but its very hard to stop. The cops can only do so much anyways, the courts do not like prosecuting people like they do in oakland and macomb county, or nice burbs with their own courts. Actually the oversight agency of the NYPD just released a report documenting that there is no empirical evidence that kind of policing accomplishes what you say it does-“broken windows” policing is a theory that has no evidence to support it. What helped most in New York was stop-and-frisk, an effective but unconstitutional way of keeping people from carrying guns, and swarm policing, where police surround an area immediately after a call. That’s possible in New York, with 35,000 officers, but not in Detroit with 2,800. New York, including all areas covered by NYPD, is 3x the size of Detroit.